In this article we review the best petrol strimmers with wheels in the UK market. Many gardeners, landscapers and those with large gardens, know the benefits of using a petrol strimmer. For many though they can be a little heavy, and often cumbersome to use. One alternative method of getting around that problem, is to buy a petrol strimmer on wheels. That way you get all the benefits of them being portable, powerful and durable. At the same time you do not have to worry about carrying the weight of a 2-stroke engine around. The engine and strimmer are mounted on a rack, that sits on top of the wheels. So goodbye to aching backs. Many professionals use these. For home use, the people who buy these, are generally speaking people with larger gardens, or who maybe look after one or two gardens. 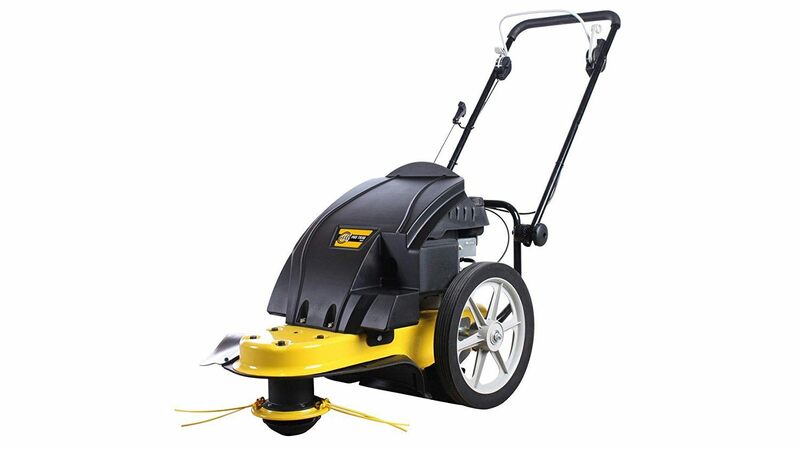 This is an expensive wheeled trimmer, but if you decide to buy, you will own one of the best petrol wheeled trimmers, currently available in the UK. 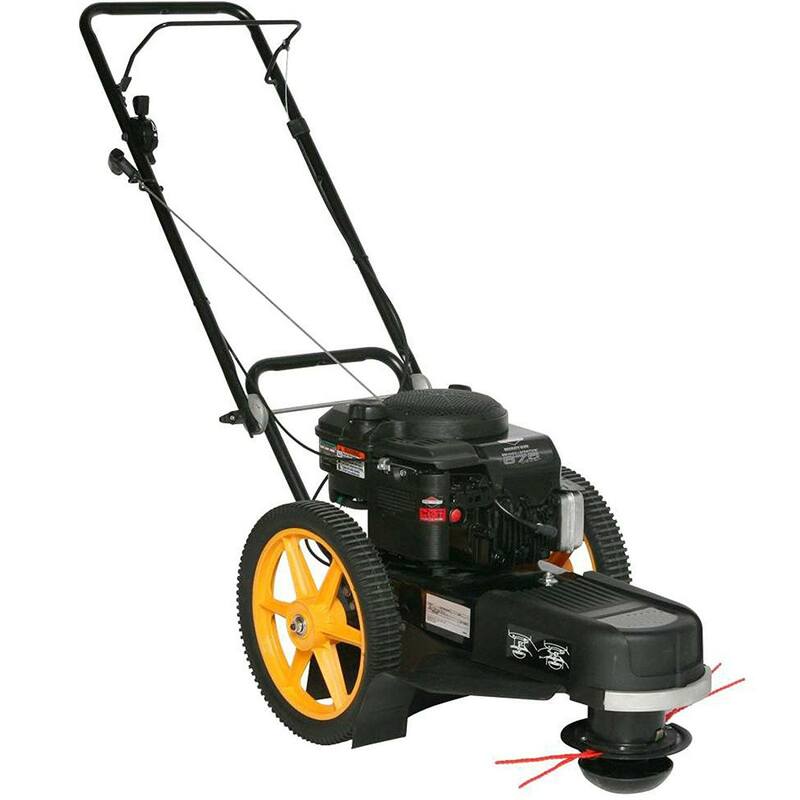 This one use a very powerful Briggs & Stratton 675​ series, 190 cc engine, to drive a head with quad cutting string. It is perfect for clearing rough terrain and larger gardens. It has a 20" cutting swathe, so clears a lot of ground very quickly. 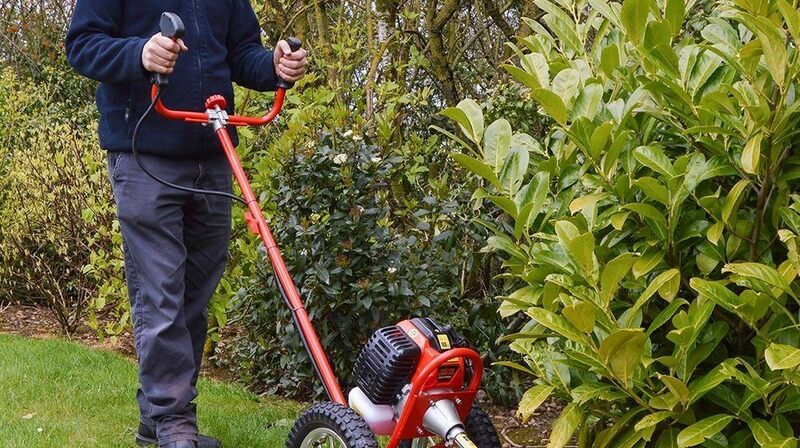 This is a powerful 4 stroke petrol strimmer designed either for professional contractors, or for those with VERY big gardens, or large areas of grass. This model is our number three choice on the UK market at this moment in time. 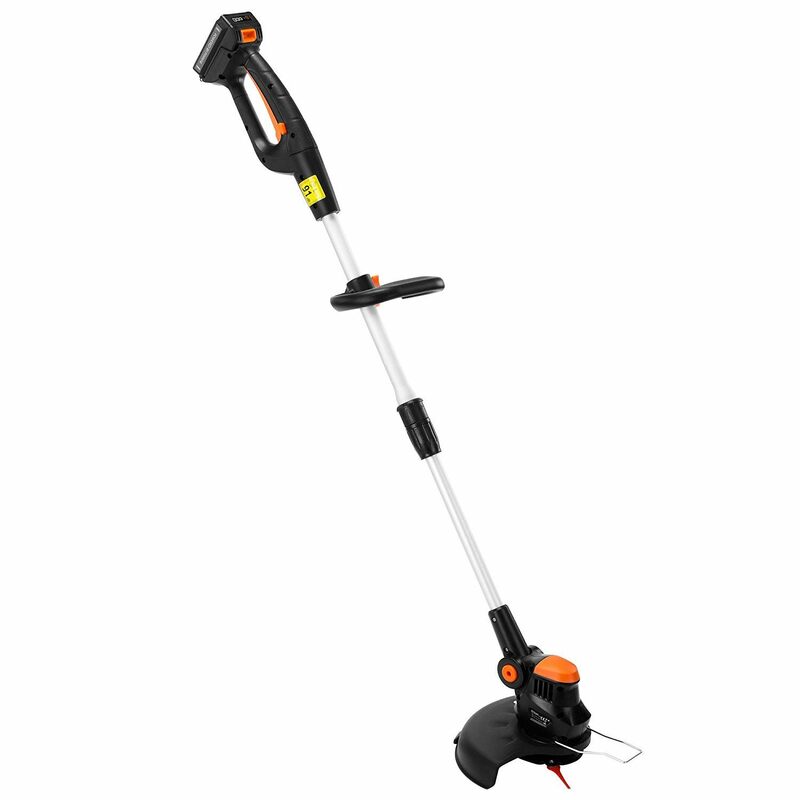 Priced at around £45 it is also the cheapest cordless strimmer on our list. This strimmer is different to those above as it does not use a strimmer line. Instead it uses hard plastic blades to do the cutting. It comes fitted with a blade and you get an additional 9 blades. It is ideal for those who are fed up of trimmers where the line constantly breaks. What To Look For When Buying a Petrol or 2-stroke Trimmer? Any of those that are on our list above are very good choices based on all the researching that we have done. We have done a full buyer's guide for trimmers which you can read by clicking here. However, if you have decided that a petrol one is best for you, here are a few tips to help you get to the right buying decision. At he end of the day, if you decide to go for a petrol strimmer, then the engine is the big difference. Anyone who has owned a 2-stroke engine, will be all too familiar with the number one problem Staring them from cold can be a real pain in the you know what. Things have improved of course, but even these days, you can still end up with a stubborn machine. The ones that I have on my list above seem to have avoided that problem. Some of them are 4-stroke engines and they start a great deal easier. The first choice for many buyers is whether to use a line system or a blade system. The VonHaus one, at number three on our list uses a plastic blade to do the cutting. For those who hate line feeds, that is a good alternative. However, that type struggle to get in close to edges like garages, sheds or kerb stones, without damaging the blades. They do however work well if you just want to quickly cut long grass.